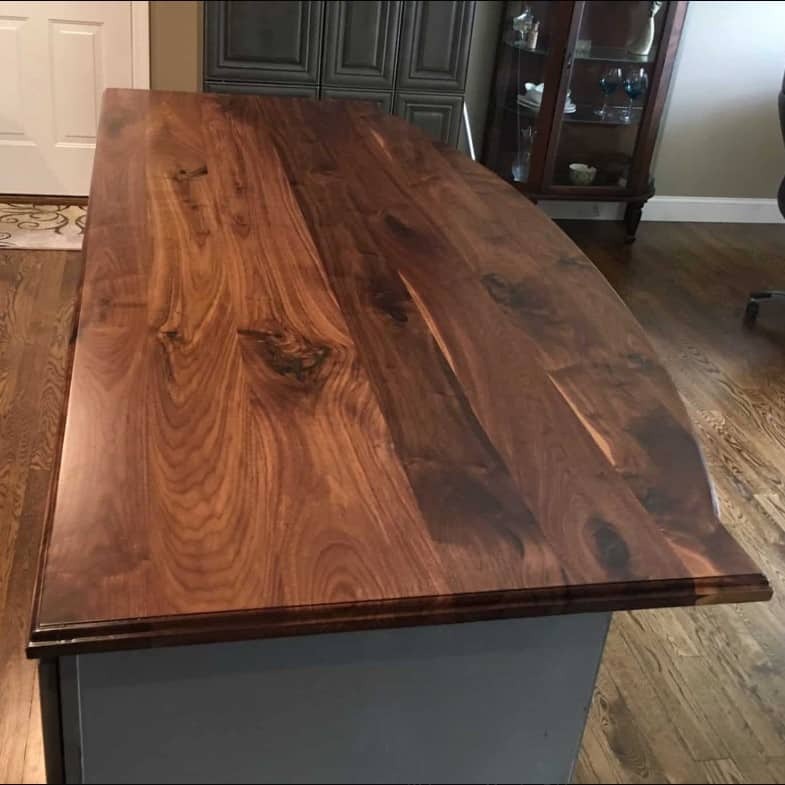 Our custom wood countertops come from many species and sources, so here’s one type: New Black Walnut. 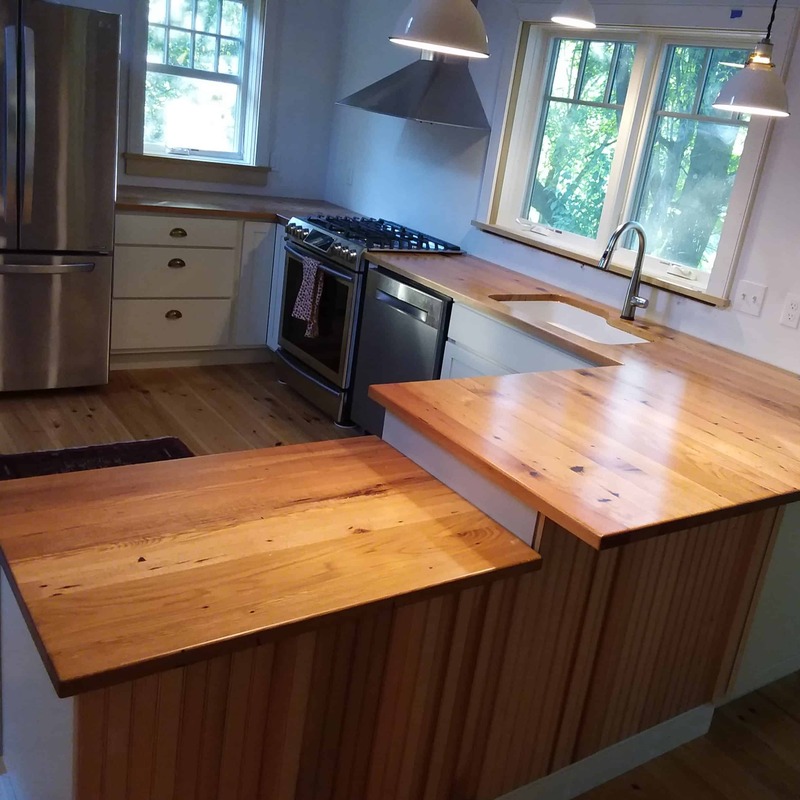 This wood, sustainably harvested in the Northeast, offers really beautiful sapwood and heartwood dynamics. 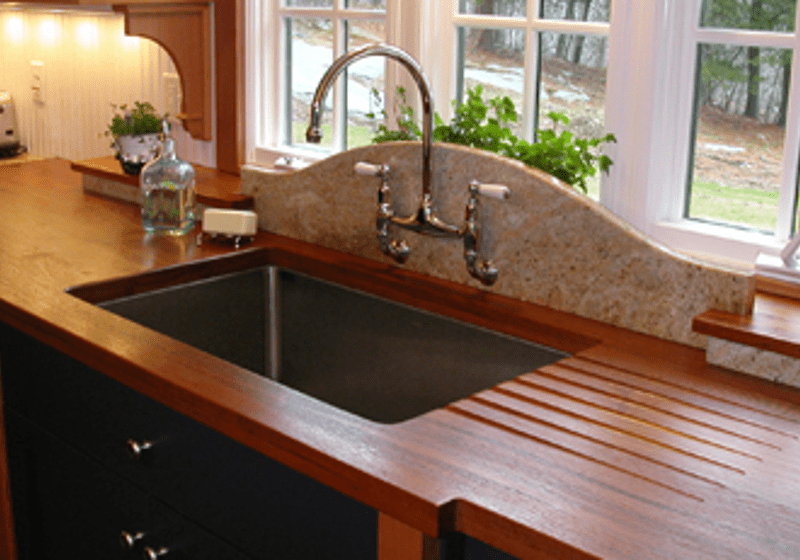 For 15 years, we have customized for some of Connecticut’s finest homes, businesses and kitchen designers. 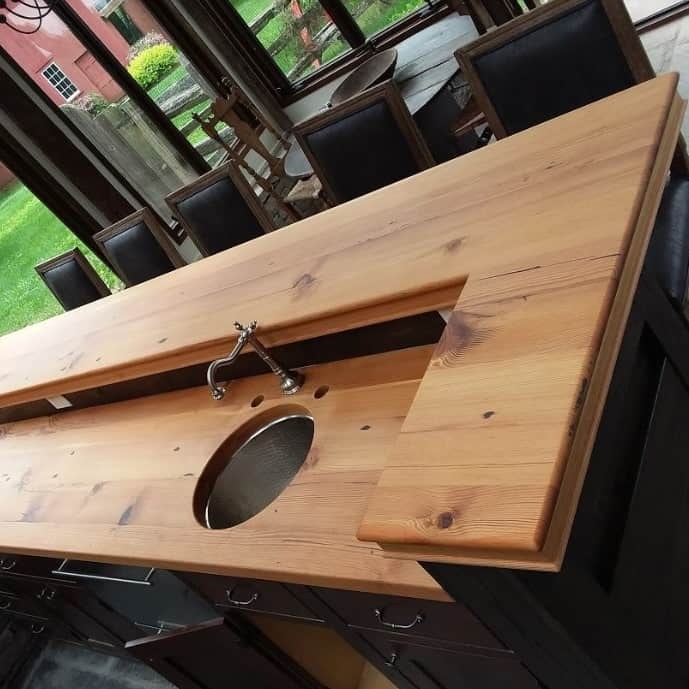 We offer many options, some from the biggest US reclaimed wood selection. 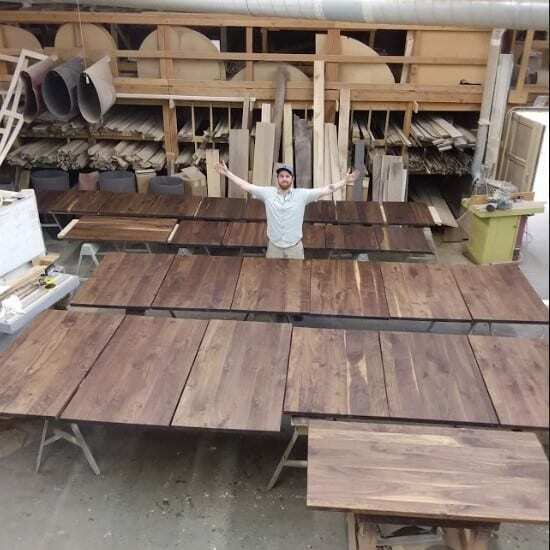 Here’s 28 Black Walnut table tops we made for Glastonbury’s Beam House. 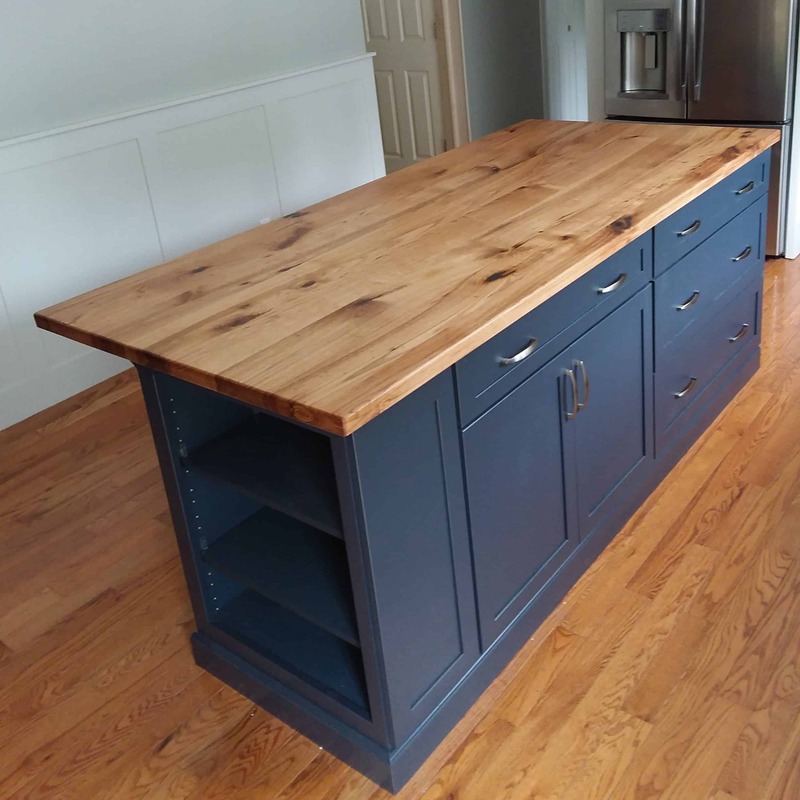 And there’s a Hickory Wood Island top for a Massachusetts customer. 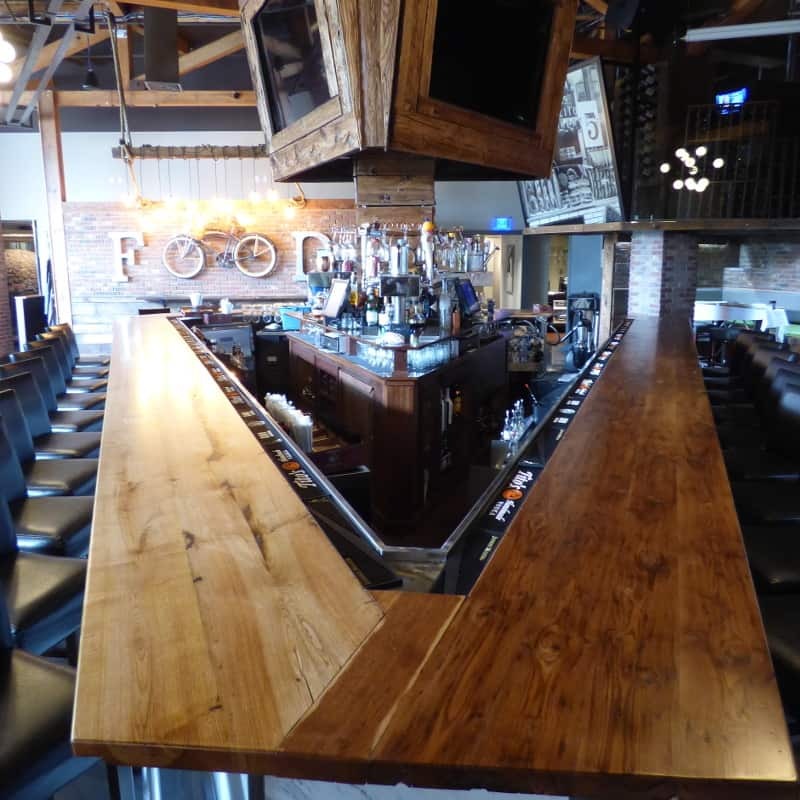 Our reclaimed wood can be centuries old and stronger than new lumber. Two great Old Growth woods that customers love are our Heart Pine and American Chestnut. 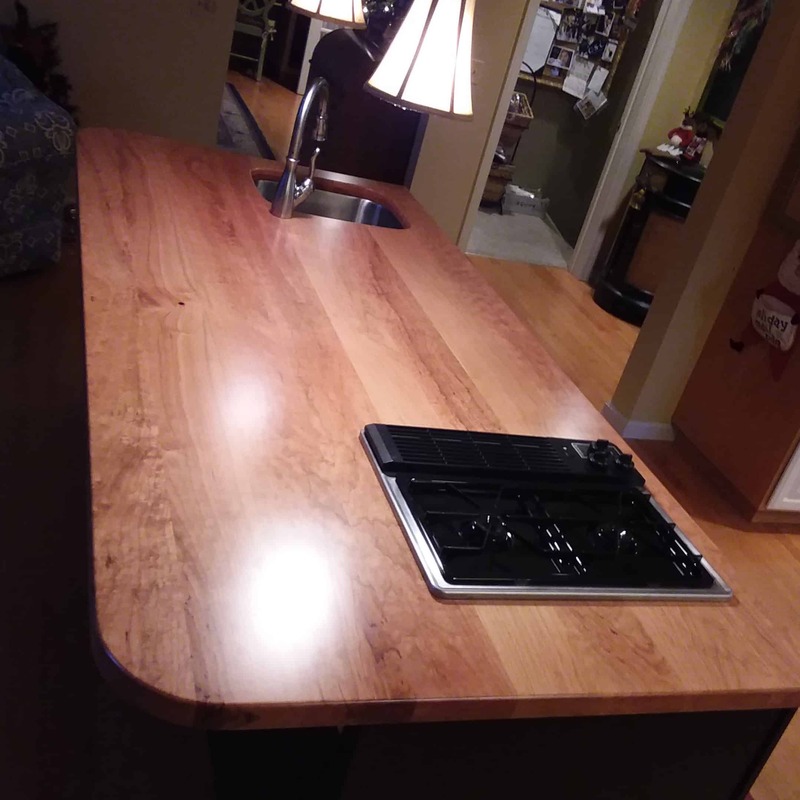 This Heart Pine bar top shows off its warm glow and grain dynamics. Next, we milled our rare chestnut wood to create a fixed table island. Historic wood like this won’t grow again. In the past, people met under trees and by wells to share news and views. Today, bar and restaurant designers attract people with wood’s beauty…and liquids. They’re classic elements for reflection, sharing & enjoyment. The New Park Brewery and Butchers & Bakers are hospitality clients that chose chestnut. This wood looks great and tells a good story- just in the grain and colors. We’re experienced millwrights and love to create our customers’ designs. We make a difference in how a space looks and feels. 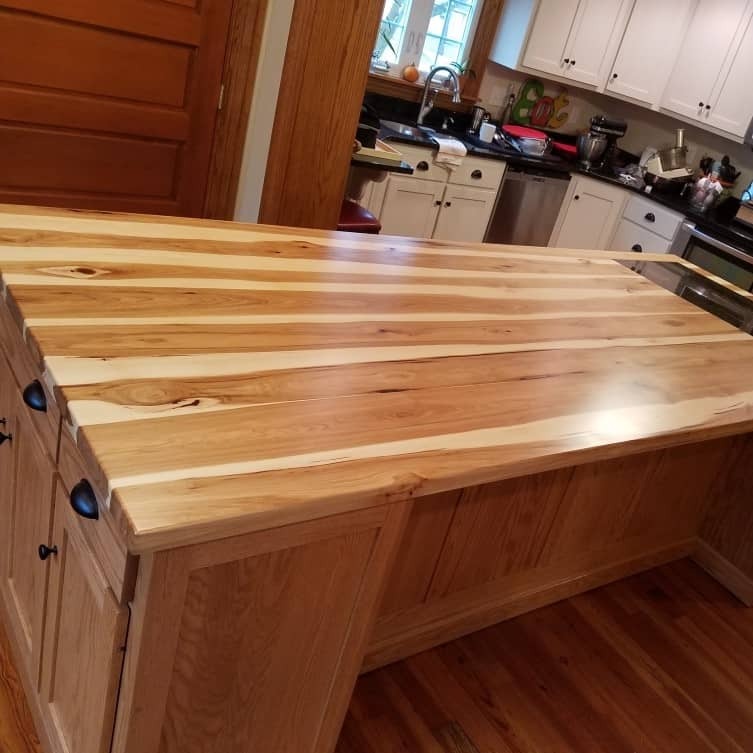 Decades of milling and finishing expertise with both new and reclaimed timber ensure tops that get the best kind of attention. 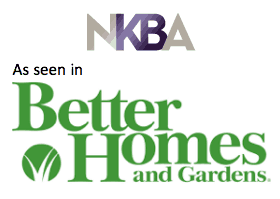 As seen in Better Homes & Gardens. 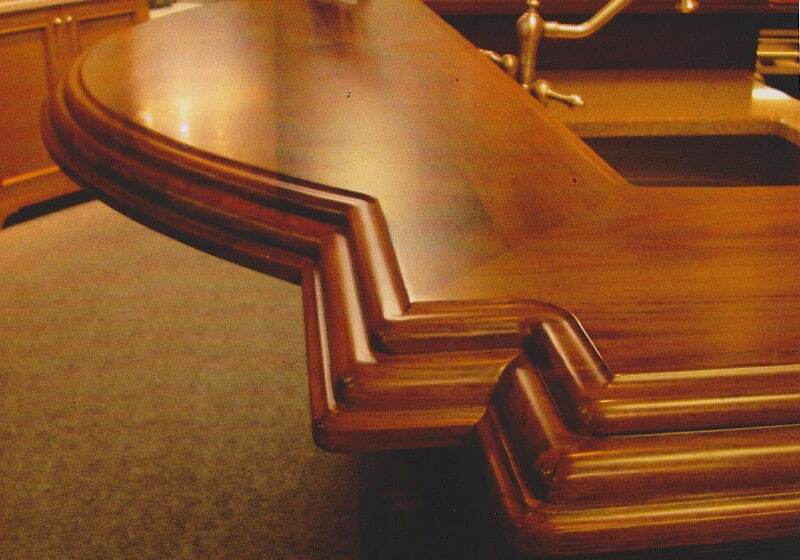 We make a wide range of hardwood tops with various species. Nut wood, fruit wood, oaks and more all have distinct looks to design your space. Here’s Cherry wood looks – from pinkish to deep red tones, with fine grain figuring. 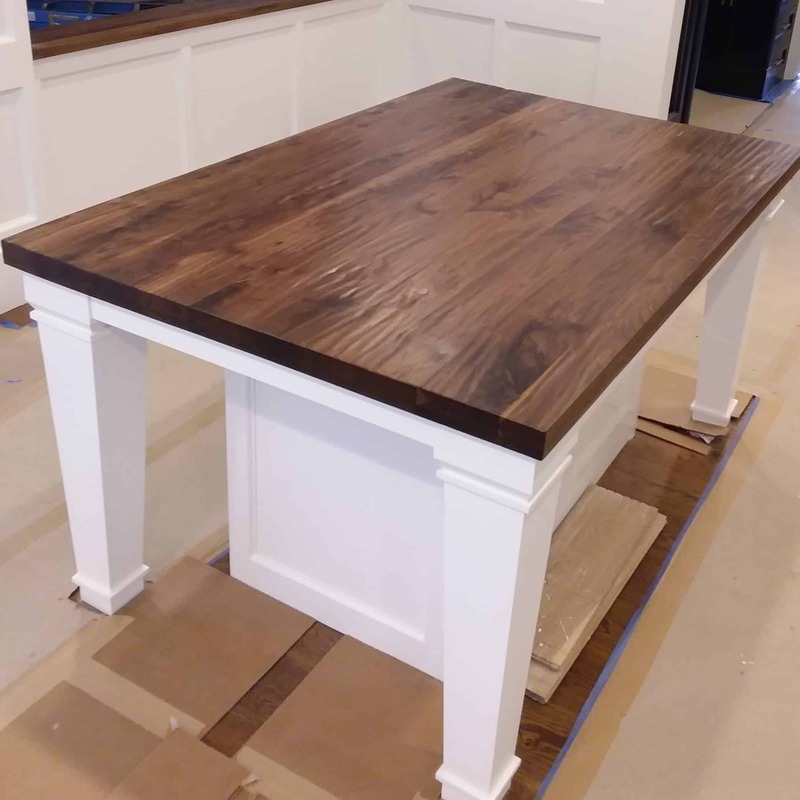 This island top is customized with inserts, showcasing light sapwood. The pantry tops show how rich it can get. We also carry very rare reclaimed cherry wood. We sell new and reclaimed red or white oak. 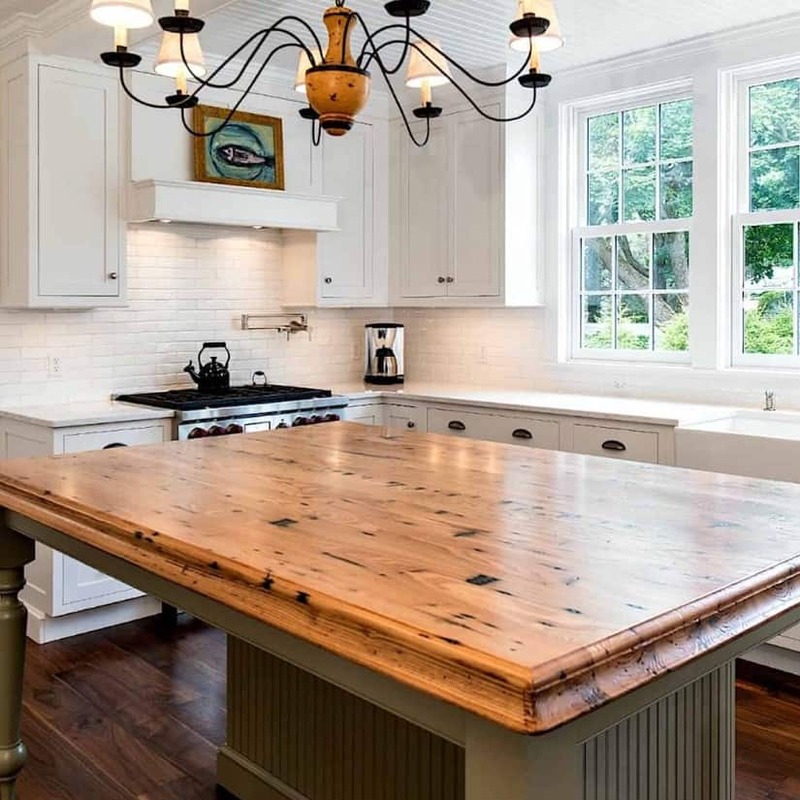 This split L-top is reclaimed white oak, a gorgeous, intricate choice from old barn timbers. 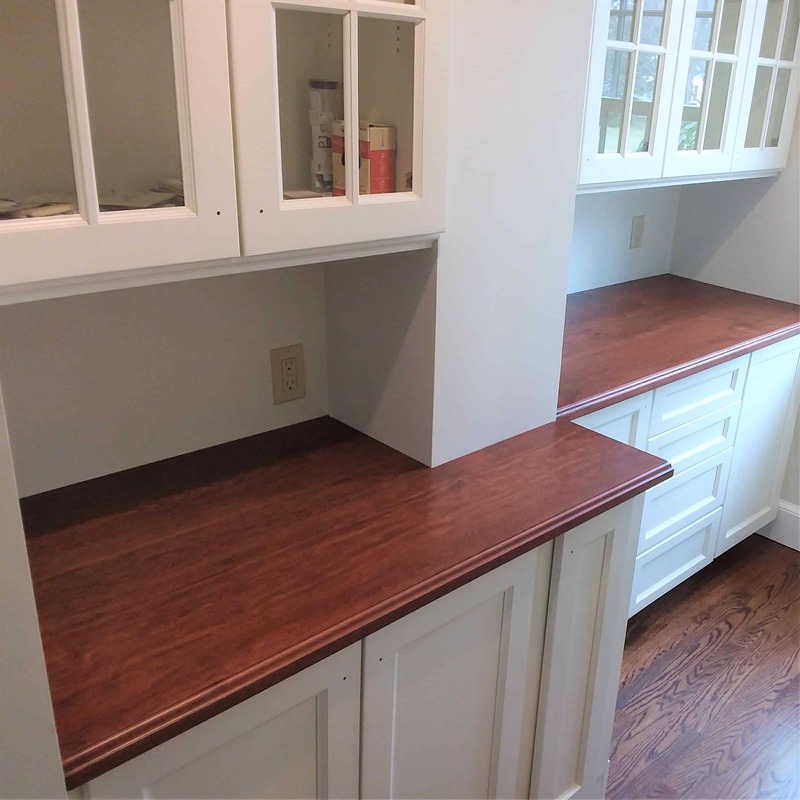 Red Oak is very close to White Oak in color and grain. From France’s famous sustainable forests (est. 1620). 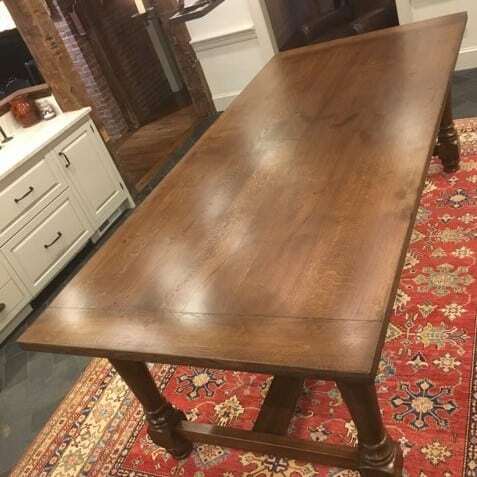 This fine grained, stained French oak table offers subtle grain figuring. (We have red wine cask oak and mushroom wood, too). 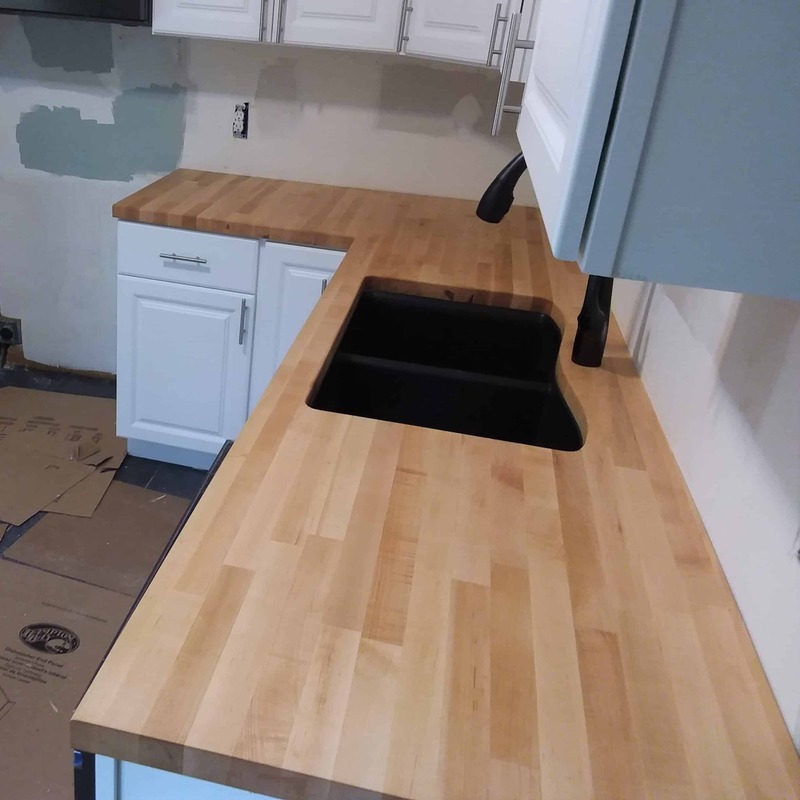 Maple Butcher Block is a popular choice that looks great and is quite affordable. This classic is found in homes and restaurants across the US since Maple is a wide ranging and versatile tree. Here’s two tops of this rich, dark and complex wood. Sapwood can be quite light and heartwood can be purple. Customers have also use this wood for flooring and stair treads. The first is a hand-planed surface for a rustic look and feel, with a matte finish. The next one shows the range of colors found in this lush wood. Come have a look for yourself! We’ll create your unique design element. 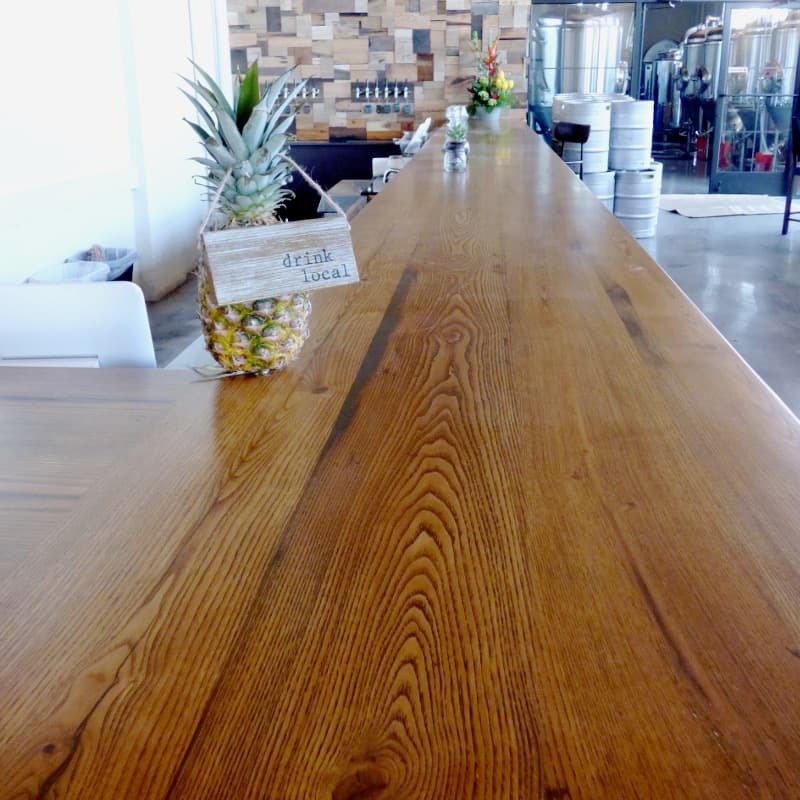 A wood top’s aesthetic and functional qualities make a beautiful surface that inspires connection and good times. It complements or contrasts, and attracts attention to the finer things in life like beauty, sharing, creativity…and company. Ask one of our customers! Call Cindy or Ken and set up a time to visit – or just stop by. We look forward to working with you to craft a special top.